Do the grapes need to be laid out exactly the same? Or just the overall effect the same. I’m not bothering on laying each one out. But it’s a personal challenge, so get as detailed as you can to make it look exact. If you can find or model a bottle, you can use a cloner on the grapes to align with the vertices the bottle model. Should give you a similar or closer result. 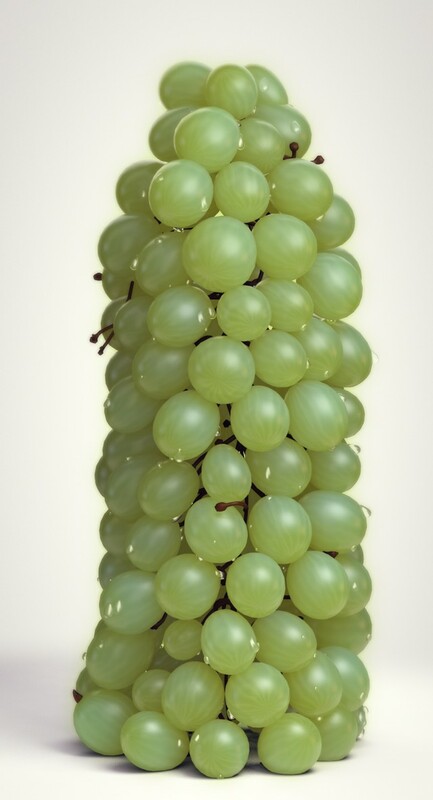 I am still pretty new to C4D and couldn’t figure out how to make any stems and stuff but I wanted to see what I could come up with for textures and the look of the grapes on their own. Any Suggestions on good ways to create the stems? Sweep a circle along a spline path. Not the same item, but I created this for a client using fruit and veggies. Those are awesome renders, Harley. Care to share any tips? Thanks Nick. Im not sure what I can share really, It was just a matter of trial & error. Playing with different lighting setups & playing with reflections on the object surfaces. Also try looking at finding textures of the objects you are after. I’m still new to c4d here. How the heck have those grapes been positioned like that. I’ve put my grape in a cloner in object mode. The object is just a rough bottle shape. To solve the intersecting grapes I used a rigid body tag with Nick’s follow position trick. I think the 2nd one looks marginally more real, although both are looking excellent! added some veins and a bit more variation. Ok, i like to know which shader it was. And was it C4D? Vray or Octane Renderer? To get close to this it could help. To use the same tools it might be easy to get this. I’m stuck. I need a Map reflection. I have tried it with the alpha channel. But that does not work. There appear black spots on the texture. But I would like to have reflections there. Where do I make the mistake? The texture should serve as a wet map. I thought I can create a texture, in which only the areas reflect where is black in the alpha channel available. Did you have any luck with the second layered texture for the reflection map? I can’t get it to work either. Hi, I’m a c4d beginner. Rendering is very difficult for me. Here is my test image. I think I will struggle with the water on the grapes too. The droplets are easy enough but the actuall water over the surface may be more difficult. What it honk is amazing and adds to the realism are the green streaks on the grapes that look almost like veins. How would you approach them? When do entries have to be in as I can’t work onto for a few days. I think I would go about that water in the specular, try using a noise pattern with a close low/high clip. Maybe a Naki/wavy turbulence. Then it’s a matter of getting the right scale and placing your lights to get the right hits. It would be really useful to have a universal scene file then everyone can concentrate on the look rather than the modelling. I forget the name but there’s another (Maya based I think) site which holds render contests, and always posts up the source files for people to use as the basis. I realise it’s not the most complex scene in the world, but the consistency would make the final results even more interesting. Good idea. This one should be simple enough to model. But, for more complex scenes, that would be a good idea. Yeah when they have render challenges on C4DCafe the scene file is usually provided. I think if its a render challenge then it should be a render challenge and focus should be on the texturing/lighting etc. No matter how complex the scene, everyone should be working with the same model. Though I guess if its just a fun thing and no prizes are at stake its not as important…..its all good practise. Here is the model I am using for my render if anyone wants it as a starting point. Its not perfect but it gets the point across. Thanks for sharing. I went about it in a completely different way to you and I learnt a lot about your workflow just by looking through the scene file. Did you use any dynamics originally or did you manually position all the grapes/vines? Did you use the connect object as the parent purely for the purpose of plugging into the water drops cloner object? If yes then I take it that grouping them as a null doesn’t work in the same way. What a great community! Thanks for all your contributions. I’m glad my file could be useful for you. Ive learned so much from Nick and all the guys at GSG and this community so Im always willing to give back. When I approached this I started with a basic model of the bottle. I cloned several variations(different deformer values) of the grape, with a short vine coming out of the grape, onto that bottle. I found a seed I like of the cloner, then added dynamics to the grapes and a collider to the bottle and cranked up the follow position. That helped spread out the grapes. That got me pretty far, but then I then hand placed them to look as similar to the original picture as possible. I then drew a spline for the main vine, added a sweep NURBS and hand adjusted the vines coming out of the grapes to attach to the main vine in a grape like fashion. Yes, I did use the connect object as the parent purely for the purpose of plugging into the water drops cloner object. No, grouping them in a null does not work. The null wouldn’t work because the cloner will ignore all the children of the null. The connect object makes C4D think everything beneath it is all one object. Thanks for providing even more insight into your workflow. I didn’t know about the connect object – that one will definitely come in handy! had a go: pic.twitter.com/FY7aNbSv5S used the gsg grape texture to start with then another built in grape texture. Tried the gsg cherry texture and changed it around (left). Struggling to get the wet look happening. Using the water surface texture in the reflection channel. Also my water drops have gone black for some reason. I’m happy with the scattering and reflections in this one. I tried the texture with noise in the diffusion channel with a huge vertical scale, but I feel that it could be more veiny. Render times started getting very high sub-surface and some transparency. I’m not even sure where to begin with the water droplets and sheen over the grapes. 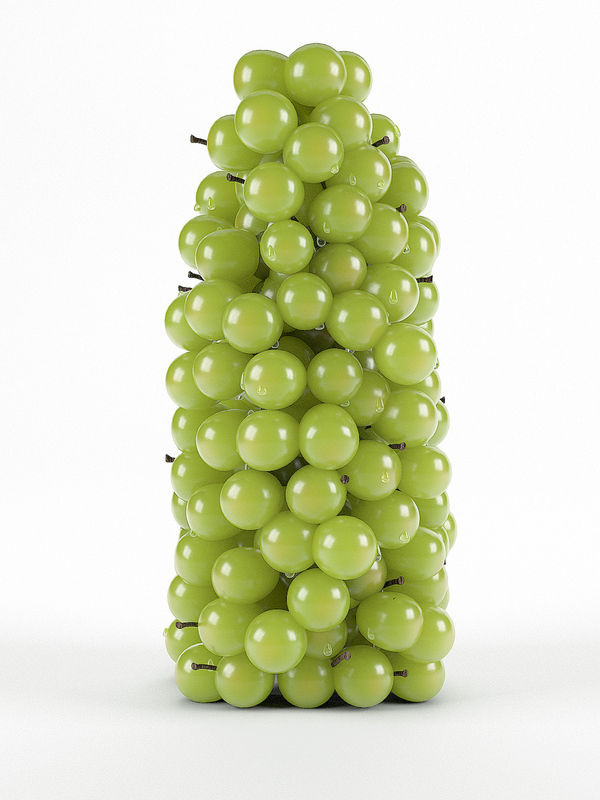 Hey guys, don’t know if it was mentioned already, but there is a SSS Grapes.c4d file in the Studio/Render folder in the content browser (via Raeven.be). Not a bad jumping off point. Cheers! I’m not going to be content with messing purely with speculation for the wAter. At the end of the day the water lies on top of the grapes should it ought to have depth(albeit very thin). I believe that the context for rendering is a great idea with pre supplied scene files. We could all contribute. I have stuff I’ve modelled and never got around to texturing. Hi, Need some help, I used Dynamics Body Tag and Force 10 for not grapes to overlap with each other but its still overlap… I tired other force setting also but same still overlap, anyone suggest any setting for not to overlap…? Greets. TIA. But i just couldnt get the color right with the subsurface scattering. Ended up with 2 versions….on with G.I. and one without…. Too much reflection, looks like porcelain grapes. Try to use random effector. Try to crank it up the light, and put a back wall, to make a reflective light source. Your scene is to dark. You are going good, but try more, lights, SSC, Transparency, etc. Couldn’t quite figure out the splashed water (not the drops), but I got as close as I could without spending all day! I tried to post this comment a bit ago, but it didn’t show up. Hopefully better luck this time! Did you all go with SSS as my initial tests are proving fruitless as the render is too long. I have r15 too. Nick do I have to still add global illumination outside of the physical render or is there a setting I side of it? I’m just playing with it and… crap… It seems like I never used c4d materials before! we need definitively some good tutorial on materials and shaders. 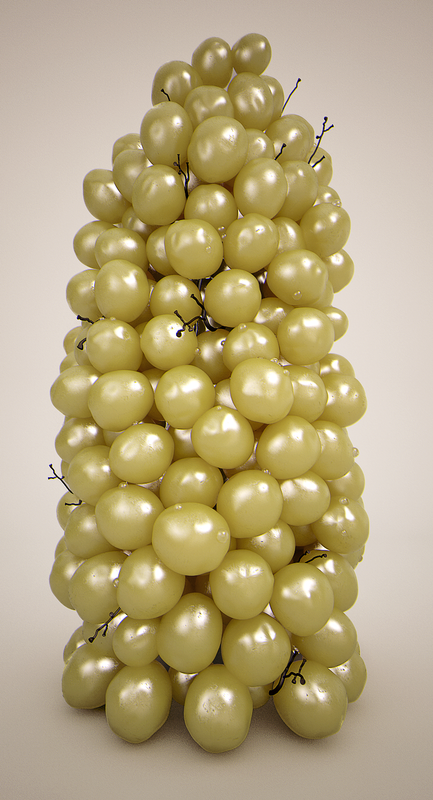 I tried to load from the maxon package the project grapes, and the material is sooo complex!! then I tried to add some lights, and I couldn’t get I want. like a banana an orange and a watermelon! I searched on the internet but it seem there are no valid tutorials about it. Christian Otten got a really good result in my opinion. I definitely agree….although alot of people here dont seem to have an issue…that was one thing i had issue with in my example. Getting the materials to look just right. Something i thought i had well in hand. 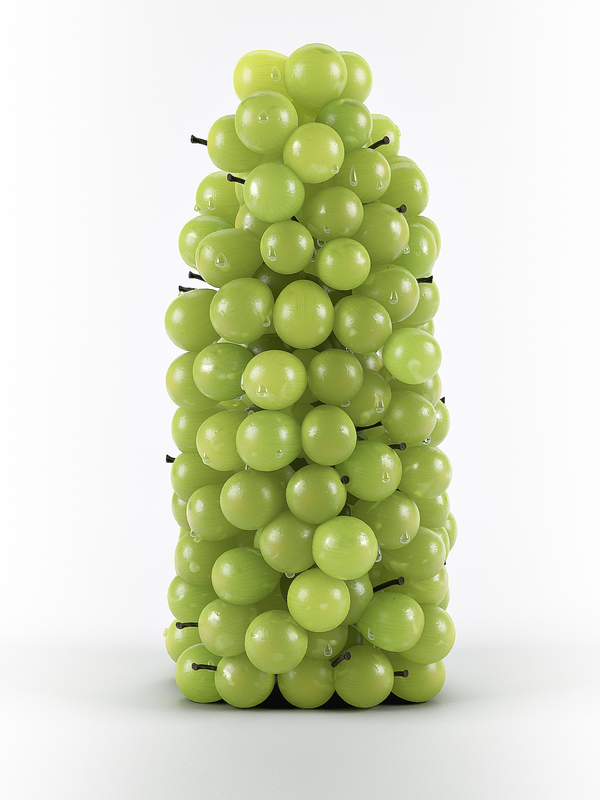 But with something natural like grapes in this example….its just so hard to get it to look right. A tutorial on things like….the fusion shader….the SSS along with other effects…etc would make a world of difference. I couldn’t get the bottle shape exactly right without arranging them by hand, so I made them dynamic and hoped for the best, but I’m happy with the texture. Added a label for those who aren’t familiar with grapes. Great texture. Did you use SSS? How did you get the veins? nice one Sikko!! and thanks for sharing! Here it is my result. Still struggling with the water drops and the wet feeling of the grapes. Done with Vray and SSS. Great challenge this one Nick. Best looking so far. 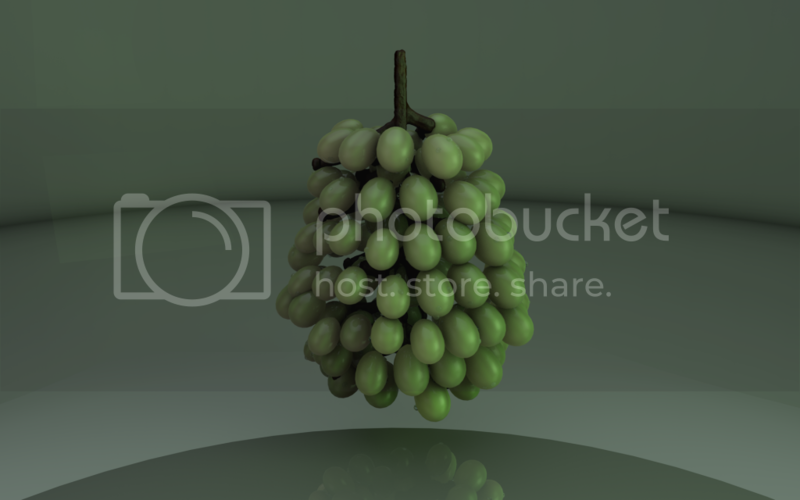 You can use a second material on the grapes without blurred reflections and with some alpha for the wet splashes. And maybe add another hard light that excludes everything but the water drops for those sharp reflections. Also a turb noise as a layer mask on the diffuse for the little veins (those are looking great but with this small visibility variation might look super real). How did you get the veins? I’m really struggling to get the a hd yours look amazing. Did you have to uv unwrap ? Ok a gradient in the alpha channel. Can you explain more? I thought that if you,put anythng in the alpha channel it would make the texture invisible? Tried posting earlier, but I guess it didn’t work. Very valuable lessons learned in this challenge. Everything was accomplished with procedural textures, and standard lighting. I used the Standard Renderer with no GI. Struggled a lot with translucency, but I’m pleased with the overall result. Nick, along with the 5 second projects, you should do a monthly “Monkey See, Monkey Do” (aptly named) challenge like this one. Great learning experience! Hey you guys, beginner C4D guy here. I’ve been doing this render challenge for a couple hours and wanted to post my project. I’m liking the grapes but not super happy with the stems. I used the connect object to connect a stem to a grape, cloned drops to the grape object and made that cloner a child of the grape object, then used the connect object on that hierarchy, put it in a null and cloned the null onto a capsule object with a taper. Rigid Body tag seems to work on the grapes but the stems poke into the grapes. If anyone has any advice/CC I would love to hear it and I would love some insight on how to remove that pixelated look in the shadows. I also had trouble making the grapes collide with the floor. Joel, if you are using area shadows (which I presume you are), in the Shadow tab of your light(s), increase the number of minimum samples. This will smooth out your shadows, but it will increase render times. The problem with this is that the droplets will be on the same place on all the grape clones. Does anyone have another way of applying a clone to an object which is already cloned to an object? Other than that way I’m going to have to hand place the droplets individually. intentionally forgot the stems, and focused on the grape texturing, please comment. 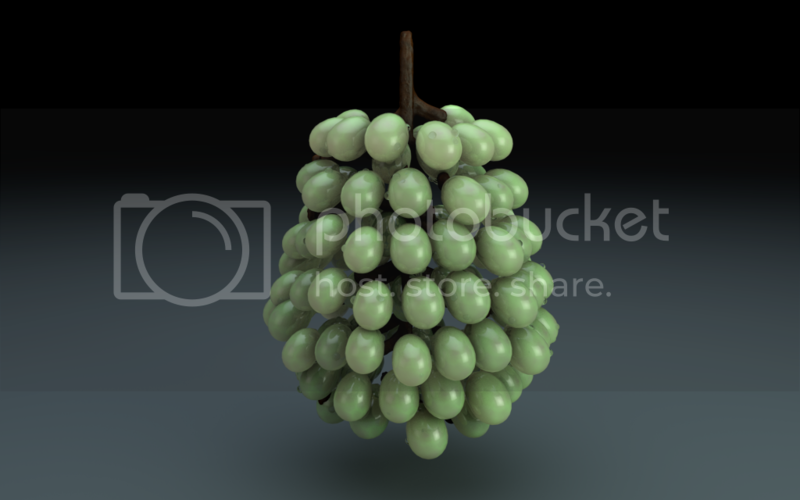 Yes, i placed another texture on the grapes, with alpha and lower(softer) specular highlights. Glad to see you liked it. I would probably start with a sphere and change the Type to something like Icosahedron. then add it under a Atom Array. change the Cylinder and Sphere radius(in the object tab of the atom array) to something really small so it looks right, then add a material with a red luminance channel. Turn off color and specular. Crank up the strength for Generate GI under the Illumination tab. Maybe mess with the transparency. Not the same yet, but sub-surface scattering is killing my old iMac! I created a b/w bitmap vein texture in Photoshop and put it with some other shaders into the diffuse channel. I noticed that a fresnel shader in the luminance channel looks much better and gave me better results. I didn’t used any post effects such as ambient occluision or GI. had some real fun making out this, and its been a real struggle for me to understand the basics of SSS2 engine..
Next up some water sprinkles. Could maybe tone down the shininess and the saturation of the grapes a bit. Then the bottle shape… Nice challenge! I really hope you´ll make a short tut, so we can see how close you can get. C4D Physical Renderer. Very slight color correct in post. It looks like the real! Yes this is a very good render. Can you please explain what you did to achieve the wet look? That was a lot of fun to figure out. I created geometry for the water using mograph cloners, metaballs, and shrink wrap deformers. Here is a screen grab of the setup. Once I liked the look, I converted it to a single piece of geo to keep the scene nice and snappy. Looks almost better, then the original Version… very nice… would u share ur settings? or maybe the Scenefile? I’ll post a scene file once the challenge is over… does it end? Either way, I want to wait a little while before sharing it. Nice one Jeremy! I am about go get a new post together showing off some of the best ones. Care to share your scene file for that post? Of course. DMed you a link. tried my best, its been a real struggle, fun though. Wow I ran out of time (going out of town) and never really got it! Hopefully Nick will explain how to achieve seedless grapes. Here is my best attempt which is more stylized than photorealistic. And here is my try in this.. I thought I’d get the texture right first – this is just a quick model with no stalks so the composition isn’t right. I’m quite pleased with the texture, although there’s more work to do on the water smears. The lighting needs work too – also, I think the SSS needs more strength. Special thanks to Jarom Brand for the nice model ! Its a little off to the original one but here is mine. My try – didn’t have time for petail details. Comment if you like. It is done with V-Ray render. Now to model it properly! Straight out of C4D. Standard renderer. No GI. Any chance on sharing the materials? Brilliant. Thanks Paul! Yes, sure, I’ll provide a link to the material file when we’re done. Is there any model ready to test the lighting? Would you like to participate but I’m not good modeling. Thank you. My attempt. Really fun challenge. Learned a lot. Thanks to Jarom Brand for the model. My re-test since I had some free time waiting for my client to revert. I think I can get closer to it than this if I had the time, the original has more shallow SSS in my opinion than mine/ Either way here is my test. Thanks and any critics are welcome. Sorry about the above link I am new to this posting behance. The below link should work if not then someone help me out. Hey John, great final result! It’s pretty close to the original one. I was wondering how did you make you way out for the grapes be in such an order? They are all looking in. I tried with cloners applied on the surface of objects and I only get the shape. Final Render – not a great model, but I like the texture. Thanks Nick for the challenge! Wow, I learned so much. This is really hard to achieve. I have no idea how to make some water that relates to gravity and I’ve got a strange black drop in there but here is my render, thanks for sharing the awesome reference! Any idea when we will get a copy of the scene files and a tut? When can we get a comment on this challenge? I would really appreciate some of your thoughts on all the renders people achieved.